The first Lockheed Martin F-35B Lightning II stealth fighter passes overhead at 40 knots prior to a slow landing at Naval Air Station Patuxent River on Wednesday, March 10. The flight was one of the last missions before the aircraft’s first vertical landing, and confirmed the jet’s power and controllability at very low speeds. The aircraft’s short takeoff/vertical landing (STOVL) propulsion system generates more than 41,000 pounds of vertical thrust, and enables airspeeds from zero to Mach 1.6. The F-35B will be flown by the United States Marine Corps, the United Kingdom’s Royal Air Force and Royal Navy, and the Italian Air Force and Navy. It will be capable of operating from small ships and austere bases near front-line combat zones. F-35 Lead STOVL Pilot Graham Tomlinson was at the controls for Wednesday’s flight. The F-35B is the short takeoff and vertical landing (STOVL) variant of the aircraft. Similar in size to the A variant, the B sacrifices some fuel volume to make room for the vertical flight system. Takeoffs and landing with vertical flight systems are by far the riskiest, and in the end, a decisive factor in design. Like the AV-8B Harrier II, the B’s guns will be carried in a ventral pod. Whereas F-35A is stressed to 9 g, the F-35B is stressed to 7 g. Unlike the other variants, the F-35B has no landing hook; the “STOVL/HOOK” button in the cockpit initiates conversion instead of dropping the hook. The British Royal Air Force and Royal Navy plan to use this variant to replace their Harrier GR7/GR9s. The United States Marine Corps intends to purchase 340 F-35Bs to replace all current inventories of the F/A-18 Hornet (A, B, C and D-models), and AV-8B Harrier II in the fighter, and attack roles. The USMC is investigating an electronic warfare role for the F-35B to replace the service’s EA-6B Prowlers. One of the British requirements was that the F-35B design should have a Ship-borne Rolling and Vertical Landing (SRVL) mode so that wing lift could be added to powered lift to increase the maximum landing weight of carried weapons. 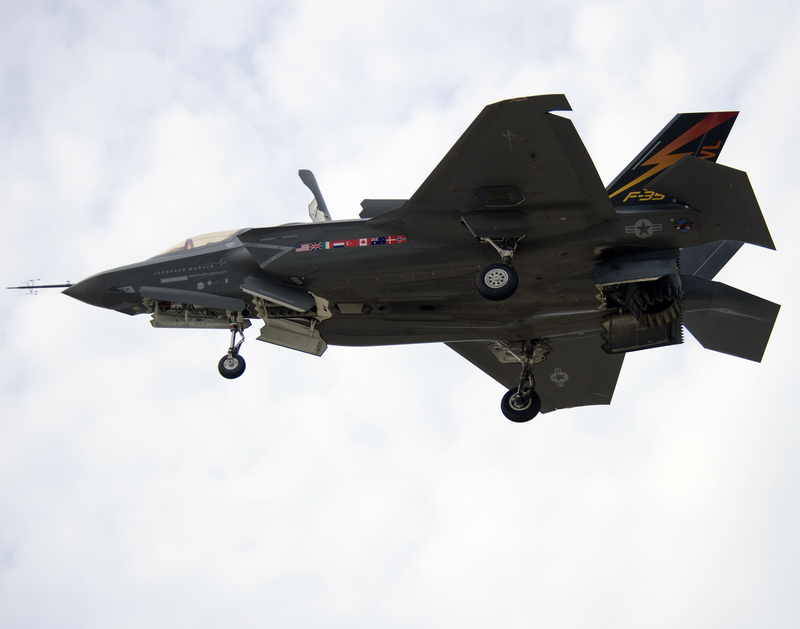 The U.S. Marines are investigating the use of the SRVL method to operate F-35Bs from CVNs without disrupting carrier operations as the landing method uses the same pattern of approach as wire arrested landings. However the aircraft is able to “bring back” 2 x 1K JDAM, 2 x AIM-120 and reserve fuel to a vertical landing. The F-35B was unveiled at Lockheed’s Fort Worth plant on 18 December 2007, and the first test flight was on 11 June 2008. The B variant is expected to be available beginning in 2012.